Efficient interface for optimizing and organizing room rate selection for multi-destination vacations. Luna Moons is a travel technology company specializing in celebratory lifestage travel. Our current itinerary tool at lunamoons.com allows couples to design a honeymoon together. We noticed that as people moved toward the purchase decision they wanted to know more about the details of the room options available at different hotels. The sheer volume of information and inconsistent vendor-provided data made this a big headache for our consumers and our agents. So we spent all 24 hours at HackathonTTX trying to solve this problem. 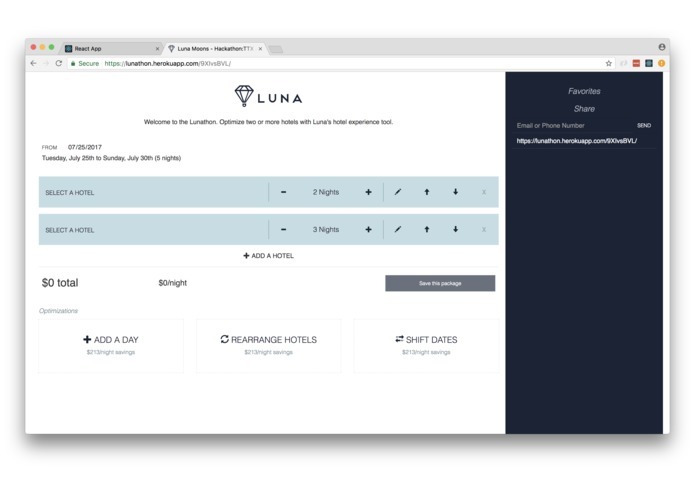 The Lunathon app allows consumers or travel agents to select hotels and compare the available room rates in order to price their entire itinerary. For demo purposes we assumed hotel selection was taken care of and concentrated on optimizing room rate collection and organization. We also included a real-time sharing component to allow travelers or agents to share their itineraries with each other. The front end is built in React with a mix of Django (including channels!) and server-less services for fetching and caching api data. The volume and consistency of vendor data created more of a problem than we anticipated. We assumed we would be able to do some data mining for semantic recommendations on the ideal mix of room rates for budget and quality of experience. We are proud of the end product and the complete nature of the demo. Our biggest takeaway was how much of an impact and performance improvement our serverless components made as well as having channels naturally integrated into our business logic. Midnight pizza is still a great treat and surprisingly good brain food. We're working on a full trip booking engine to release this fall which will include more involved integrations with the sabre web services stack.